It all began when my uncle paid a visit to our backyard. ‘This place looks quite desolate. Why don’t you rear some animals?’ he inquired my father. My father thought it was a good idea. The next question was which animal to rear? Certainly not cows or goats because they require extensive maintenance. The only animal that fit our requirements was a hen. A medium sized hen house could accommodate up to 10 hens. We thought this would be a great opportunity to make use of the space in a profitable manner. Before long, we became the owners of four hens. At least that’s what we thought until one day one of them started crowing very early in the morning. We decided to keep only the hens and got another one to replace the rooster. 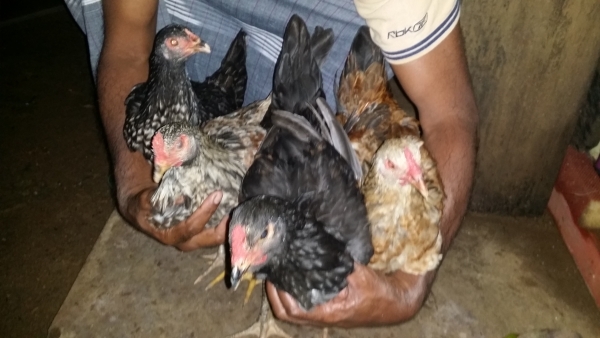 So in the end, we were left with one black and three brown hens. Me and my brother wasted no time in choosing names for them and it took us only a few days to realize that all four of them had amusing personalities. The oldest among them was named ‘Kody’. She was cautious, bossy and the timid one among the lot. The other brown hen was called ‘Oorubalai’ which literally meant ‘gossip’ in our native tongue. This hen was always the curious one. Whenever we go out or engage in yard work, she comes running out of nowhere to inspect what’s going on. The black hen was called ‘Baba’ which translates into ‘baby’. She loves to be petted and enjoys human company. Her best friend is the dark brown hen. They are of the same breed. They both eat and spend time together almost every day. Domestic hens are usually trained to go to their homes at dusk. Among ours, Kody is the first to go every day. When others try to enter, she pecks and chases them away. We realized that Kody was being territorial and did not like the idea of sharing the space with others. Oorubalai was the regular victim of Kody’s misconduct. The other two, especially Baba had the habit of sleeping on a branch huddled close to her best friend. It was unsafe to let them spend the night outside the hen house due to cats and pole cats. Hence it became a daily routine to carry all three and place them into the hen house when dusk fell. As expected, Kody was the first to lay eggs which was followed by Baba’s best friend and Oorubalai. Baba was the last. Pretty soon we used to collect three to four eggs every day. One day, Baba did not come out of the hen house. We thought she was sick as this continued for three or four days. But then it dawned upon us having seen the amount of eggs she had collected. Baba was brooding. During the next couple of days, Baba remained at her spot without budging. I placed a vessel of water and she drank it up thirstily. After 21 days, I heard the chirps of newborn chicks. It was very exciting. I rarely got a glimpse of them. However, when Baba took them out for evening walks, we all loved watching the chicks following their mama learning the ways of survival. Baba was a proud mother of four. The chicks grew fond of us and ate food out of our hands. We were delighted to have hens and their young ones growing together. My notion of hens being raised as farm animals only for eggs and poultry completely changed due to the closeness I felt with my hens. Just like other pets, they too appreciated love and companionship. It’s a lesson taught by my feathered friends.